Have you ever heard of Carpal Tunnel Syndrome? If you feel some numbness around your hands or palms, consult your physician immediately as these symptoms might lead to serious damage to your life. Most bedridden patients experienced numbness around their feet or hands in the beginning, thinking that it was just a twist while sleeping or some simple daily usual occurrence. Often, they tell us that the feeling of numbness was just nothing, until time had passed for several years. One day they noticed that they failed to even hold a cup of coffee or else dropping it. Bear in mind that these are all dangerous signs to your health. 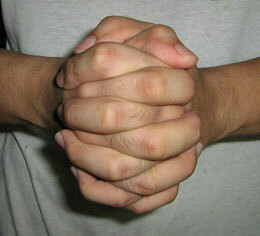 In carpal tunnel syndrome, numbness usually occurs at thumb, index, middle finger and half of the ring finger. What is the real cause of carpal tunnel syndrome? 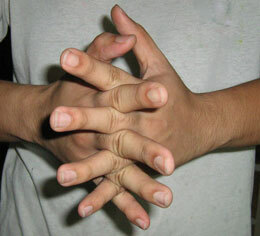 There are several and many think that it is caused by repetitive movements of arms and fingers especially among heavy computer keyboard users. Some records show that women during pregnancy and after delivery are more susceptible to carpal tunnel syndrome than others. It is also fairly common in patients undergoing dialysis. However, according to medical groups, up to this writing, there is no definite answer on the real cause of carpal tunnel syndrome. What could be the remedy for the thumb and other parts of the fingers that are getting thin or having muscle degeneration? It is quite difficult to answer, and there is also no definite remedy that was found. According to some patients, solving the pressure of the nerve with surgical operation will correct the condition or numbness. Of course, there are cases that such syndrome disappeared over time without any treatment. 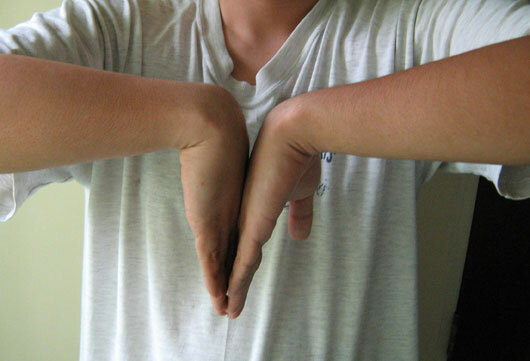 The following photo shows a diagnostic test for carpal tunnel syndrome, known as the Phalen's maneuver or Phalen's test. Bend your wrist and maintain your hands position in a 90-degree angle, pushing the back of both hands together, for about one minute. If you do not feel any pain or numbness, then you are at least on the safe level. Of course, the Phalen's maneuver is not a definite way to diagnose but it helps to know at least. Two years ago, one of our caretakers in the rice field was cutting rice straw with sickle when she suddenly lost her power to hold the sickle and dropped it. Since then, she had difficulties holding things with her right hand for a year. She is now under diet control and of course, hands, arms and feet exercise everyday with the PYRO-ENERGEN treatment. 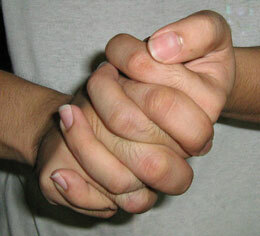 Usually, hands and mouth numbness leads to cerebral apoplexy or cerebral apoplexy leads to hands and mouth numbness. You should know that this numbness usually happens when you wake up in the morning. Whichever it is, if you feel slight numbness in your hands or around the mouth, we advise you to consult your physician immediately before anything serious happens to your health. Also, some patients told us that some numbness or strange feeling or strange vertigo occurs especially when they bend their neck (head) upward. Schoolteachers told us that such numbness occurred when they started writing on the blackboard when they bend their head upwards or when they face up. Open and close and twist hard your hands as shown on these illustrations as often as possible every day. 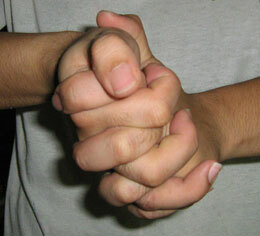 This simple hands exercise can eradicate hundreds of blood-related problems according to our experiences. In addition, do the following exercises. You can restore practically all sorts of heart-related troubles. Sit and stretch your ankles up and down for about 20 times whenever you have chance. Also, stretch your body forward and backward about 10 times whenever you have time. If you do these exercises everyday, you will be healthier than ever and you will certainly live longer.